A romantic vacation, or perfect for your family, June Lake offers the complete High Sierra vacation experience. Stunning vews from every window View of frozen Gull Lake from Interlaken 32 Units 32, 34, 37, 38 building in the winter Plenty of comfortable seating. Views from kitchen and dining room Updated Kitchen with amenities Kitchen fully stocked with everything you need. Cozy living area with plenty of room. Couch pulls out to queen size bed. Bedroom with king bed and electric fireplace Relax with a view Full bathroom attached to bedroom Shared hot tub Let it snow, let it snow, let it snow. Come see the purity and grandeur of the Eastern High Sierras in June Lake. Interlaken vacation condominiums are located on the shores of Gull Lake with Aspen trees along the shores and trophy trout in its waters. Soak up the scenic and inspiring mountains, right from the windows of your beautiful lake front Interlaken Condo. This vacation destination attracts people from all over the world because of the beauty and history. There is nearby Yosemite National Park and Devil's Postpile National Monument to view, along with many world famous hiking trails like Pacific Crest Trail and the John Muir Trail. The land here is so unique like the many natural hot springs, the Inyo and Mono craters, and the mysterious Mono Lake. There is spectacular fishing in spring, summer, and fall, and biking of all kinds with trails for all levels of experiences. You can even enjoy a leisurely bike along the Aspen tree-lined streets of June Lake. Something everyone must see is the Fall colors of the Eastern Sierras. The golds, orange and yellows against the mountain backdrop will simply take your breath away. During the winter months, take advantage of that feeling of having the ski mountain all to yourself on the June Mountain ski and snowboard resort. The powder skiing is exceptional for beginners and back country skiers alike. There is also snowmobiling, cross-country skiing and ice skating. Experience nature with the luxuries of home in your Interlaken condo. Relax at Interlaken in one of three outdoor spas or just sit on the deck and take in the views! 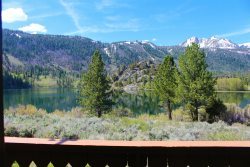 This is the perfect condo for your next stay in June Lake. Comfortable and modern with amazing views of the lake and mountains. From the entrance there is a bedroom, with a Cal King bed, followed by the bathroom. A few steps further is a wet bar, the kitchen, and the great room. The great room has a queen pull out couch. There is also a wood burning fireplace, TV, DVD player, VCR, stereo, wireless internet, and washer/dryer. There is a complete modern kitchen ready for family meals and gatherings. The dining room table has seating for six with three more at the kitchen counter. To truly take in the view, there's also a private deck, only 40 yards from water. In the complex there is three hot tubs, tennis/basketball courts, and quick access to lake and marina from a walking trail. Enjoy! Very comfy with a relaxing view. The team at June Lake Accommodations is top notch, so friendly and efficient! We called due to an issue with the WIFI, and they came out immediately to reset the router. Any questions you may have prior to your stay are answered quickly, and they make your stay totally stress free. We had the good fortune to stay a whole week at this property, truly you cannot find a better location or a more comfortable home! We have come back to both June Lake Accommodations and this property for a number of years now, and we cannot imagine going anywhere else. The property is incredibly clean and cozy, and the views take your breath away. On top of that, the staff at June Lake Accommodations are super friendly and professional. They make it a breeze. Thank you for another great stay at a gem of a property! June Lake Accomodations Staff is always friendly and professional! Great property. Well maintained. Wonderful views of the lake and June Mtn. Friendly staff. As always the June Lake Accommodations team was friendly, efficient, and helpful. Can't wait to go back! Property was clean, quiet, and comfortable. More than adequate for a mountain retreat! Everyone we have worked with at June Lake Accommodations has been an absolute pleasure, so friendly and efficient. We receive speedy responses to all our inquiries, and they have a great selection of properties to choose from. They will take the time to discuss the features of any property in detail to ensure you find exactly what you are looking for. We have been coming to June Lake for over 10 years, and will never consider using a different rental agency! MANAGERS RESPONSE: Thank you for your kind words about our staff! We hope to see you again soon! We so enjoy staying at Interlaken! The condo is spacious and comfortable, and the view is spectacular. You can tell the owners and rental agency truly care about the enjoyment of your stay, as much attention is paid to the details and items that make a rental the kind of place you will return to again and again. See you soon and thank you! The young lady there was very courteous and made us feel very welcomed. I had called to let her know we'll be late to check-in and she was very sweet over the phone. Also when we checked out she was very nice and asked us how our stay was. Great customer service skills. We are already planning for June Lake again next year and definitely will book the same unit again. Top notch, always go above and beyond to ensure our stay is pleasant. 5* service, couldn't ask for anything better! Love June lake!! Have been coming here since we were children. Interlaken condos have great views and are well maintained. Lydia, Don and Lynn were all friendly and helpful from making our reservation, communicating via emails and throughout our stay in June. We hope to come back. Please don't raise your prices. Thanks!